Era stato trasmesso in diretta streaming la sera del concerto, lo scorso 19 novembre, ora è disponibile nell'archivio YT del club Le Triton il concerto super-coltraniano del quartetto di Christian Vander (con Laurent Fickelson, Jean-Michel Couchet, Emmanuel Grimonprez), divenuto per l'occasione quintetto con l'ospite Eric Prost. Si le nom de Christian Vander est connu par les mélomanes du monde entier, c’est évidemment du fait de Magma, son groupe mythique, sa plus grande réalisation artistique. Pourtant, quiconque connaît Christian Vander connaît immanquablement sa passion (le terme est encore trop faible) pour John Coltrane, le musicien bien sûr mais aussi l’homme, «l’homme suprême». Omniprésent dans l’ensemble de l’œuvre de Vander, Coltrane y est plus que jamais mis à l’honneur dans la formation en quartet du batteur, spécialement dédiée à jouer la musique de son maître. 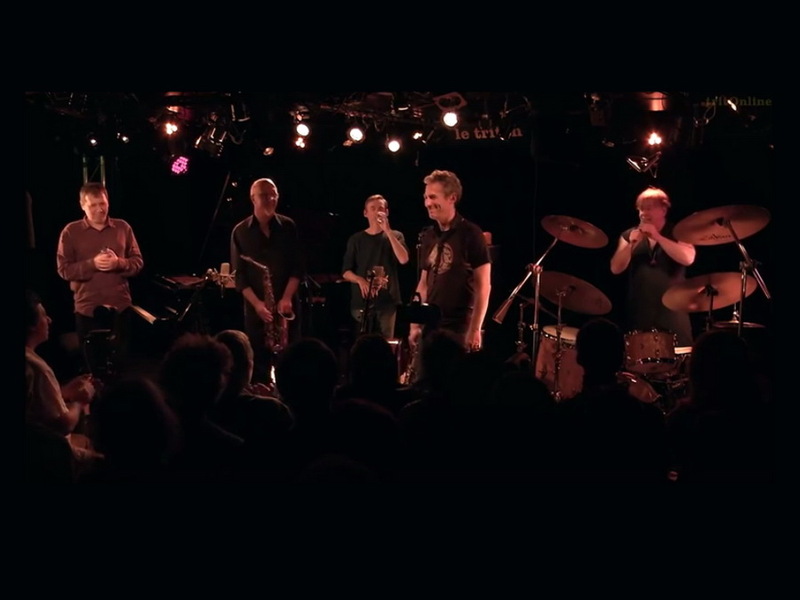 Pour l’occasion de ces concerts, le saxophoniste Eric Prost est l’invité du quartet! 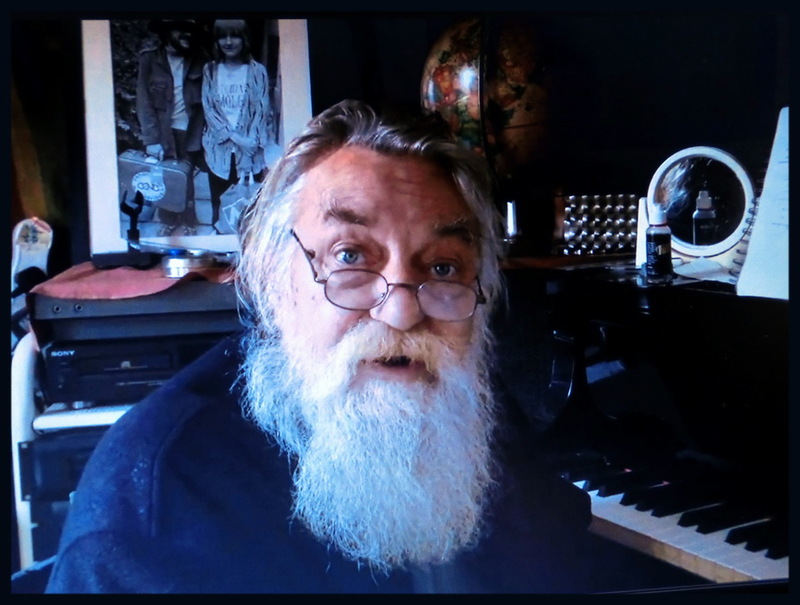 In coincidenza con l'anniversario della nascita del Poeta, torna disponibile in digitale presso il sito del musicista uno dei massimi capolavori di Mike Westbrook, quello sui testi poetici di William Blake scelti e adattati da Adrian Mitchell, The Westbrook Blake-Bright As Fire, pubblicato in vinile dapprima da Original Records (1980) e in seguito da Impetus Records anche in cd e audiocassetta. Alla sua realizzazione presero parte all'epoca, oltre a Mike, Kate Westbrook, Phil Minton, Mike Davies, Dave Hancock, Henry Lowther, Malcolm Griffiths, Alan Sinclair, Alan Wakeman, Chris Biscoe, Dave Barry, Georgie Born e Chris Laurence. Successive riprese di quei materiali, riorganizzati e ampliati sotto il nome Glad Day, hanno prodotto negli anni molti concerti e nuove registrazioni, sia audio che video. Occasione prossima per una presentazione in pubblico sarà a marzo del nuovo anno, al Kings Place di Londra. Settings of the poetry of William Blake, with music by Mike Westbrook, texts selected by Adrian Mitchell. Much of the material originally commissioned by the National Theatre for the 1971 production of Adrian Mitchell’s Tyger, directed by John Dexter and Michael Blakemore. 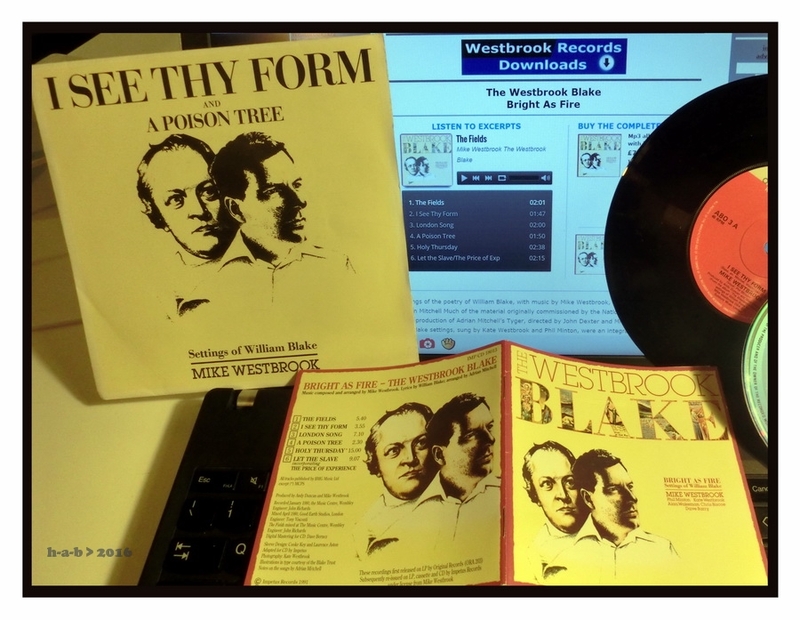 The Blake settings, sung by Kate Westbrook and Phil Minton, were an integral part of the repertoire of the Mike Westbrook Brass Band from its formation in 1973. 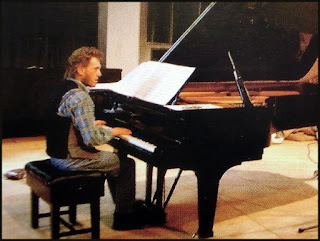 The Westbrook Blake (Bright As Fire), a programme entirely devoted to Blake’s poetry, was first performed in 1980 and has been widely performed throughout Britain and Europe, in New York (1983) and at the Adelaide Festival (1984). 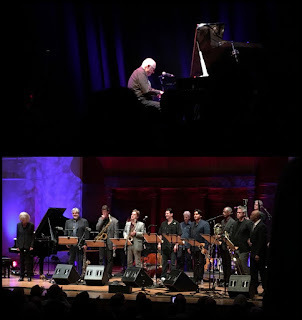 L'eccezionale concerto degli Slapp Happy assieme ad alcuni dei FaUSt, in programma questa sera al Week-End Festival a Colonia, è accompagnato dalla tempestiva ristampa degli album Sort Of e Acnalbasac Noom in speciali edizioni limitate a cura dell'amburghese Tapete Records. E da un messaggio di buon augurio che riporta il commento di tre loro illustrissimi fiancheggiatori: Robert Wyatt, Brian Eno e John Peel. 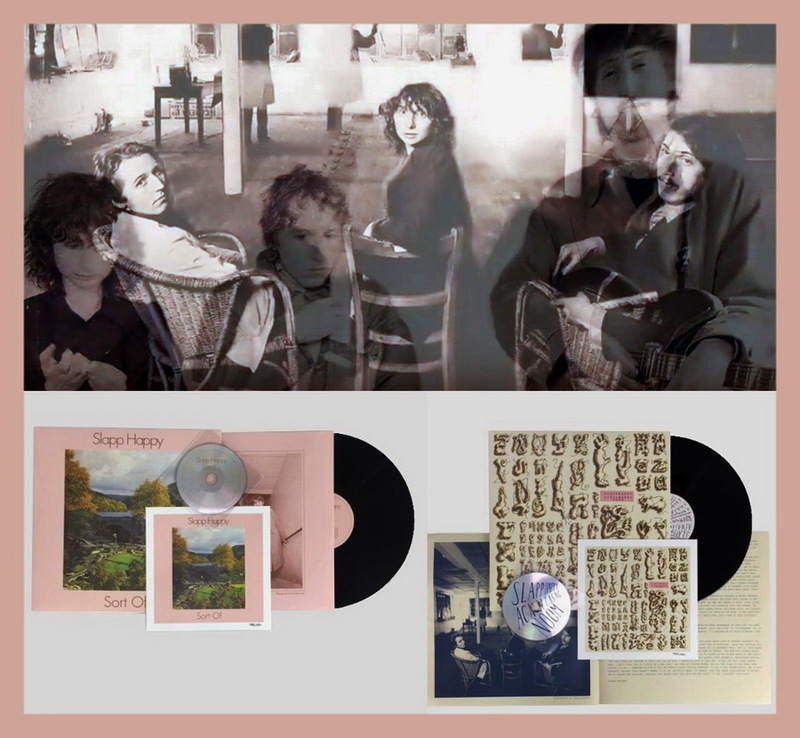 On the special invitation of Week-End Fest, the avant-garde pop band Slapp Happy will play their first concert for 16 years and will be accompanied on this rare occasion by Krautrock legends Faust. 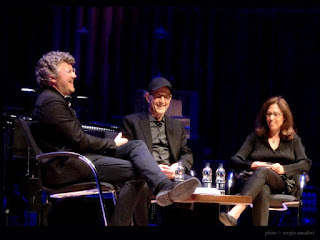 British artist Anthony Moore started the pop project in Hamburg in 1972. 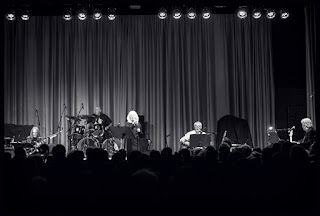 Together with German Dagmar Krause and American Peter Blegvad, Moore played enchanting songs somewhere between The Pentangle and The Velvet Underground. 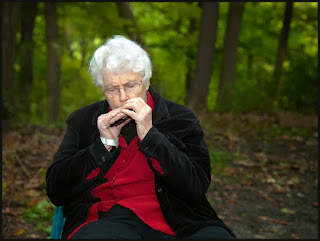 Most of the songs were carried by Dagmar Krause’s inimitable voice. 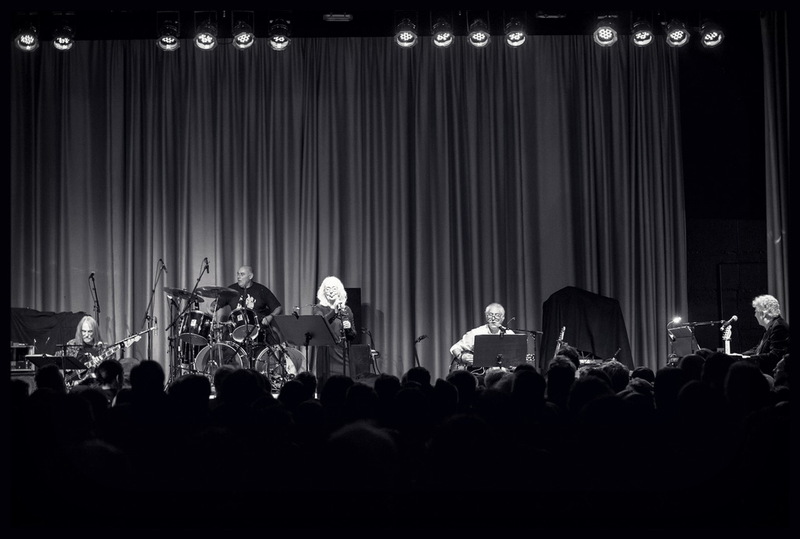 Just as on the first two albums 'Sort Of' and 'Casablanca Moon' (which was first released in 1980 in its original version as 'Acnalbasac Noom'), the Krautrock giants Faust will support Slapp Happy in Cologne. Tornano disponibili per Domino Records le ristampe in vinile di due album di Robert Wyatt già ripresi dall'etichetta qualche tempo fa: Ruth is Stranger Than Richard (inizialmente Virgin, 1975) e Nothing Can Stop Us (Rough Trade, 1982), nella versione originale senza Shipbuilding. 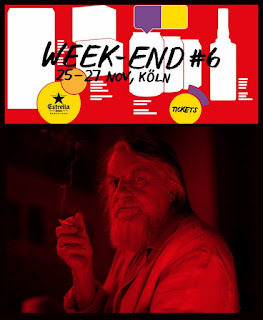 Bel dono benaugurale di Robert Wyatt agli organizzatori del Week-End Festival alla vigilia del suo svolgimento, a Colonia (Germania) dal 25 al 27 novembre: un'ora di dediche e personali scelte musicali pubblicata in forma di podcast tramite Mixcloud. Wow! Viele Künstler reden nicht gerne über ihre Kunst. Schließlich soll sie für sich selbst sprechen und jeden ganz individuell berühren. Manchmal braucht es einen kleinen Umweg, damit sie sich öffnen: Indem sie etwa über andere Künstler reden, die ihnen viel bedeuten. Ein wunderbares Beispiel ist der Podcast, den Robert Wyatt extra für das Week-End Festival gemacht hat. Indem er über seine 'most personal recorded souvernirs' redet (und sie spielt), gibt er einen persönlicheren Einblick in seine Welt, als in vielen Interviews über sein eigenes Werk. 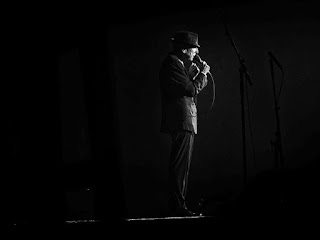 Wir erfahren, von wem er seinen 'singing not-singing'-Stil hat, was man vom Sänger Berthold Brecht lernen kann und welcher R’n’B-Song 1964 eine wichtige Rolle dabei spielte, dass er Profimusiker wurde. 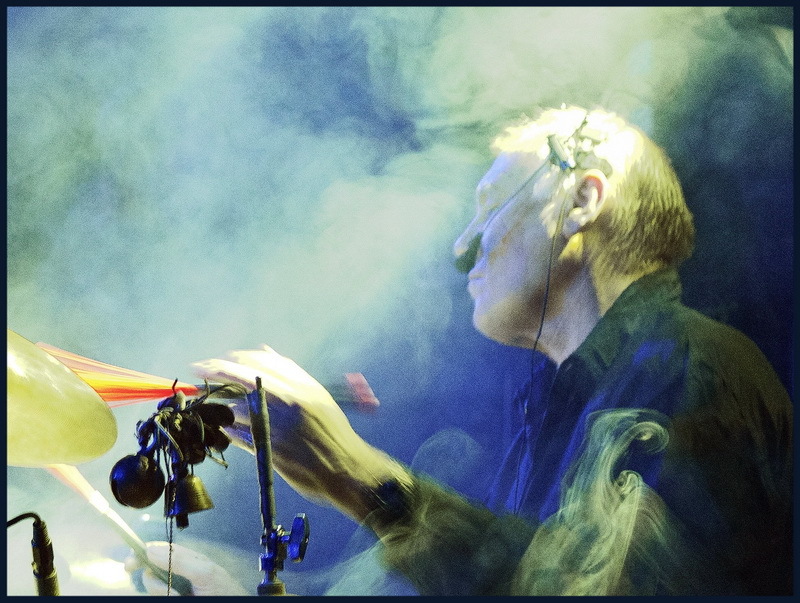 Dalle pagine del suo splendido blog Legends In Their Own Lunchtime Aymeric Leroy indaga - come forse mai nessuno prima - sulle vicende di due musicisti che in epoche diverse han fatto parte dei Soft Machine, prima di affrontare incerti e oscuri destini: Phil Howard e Larry Nowlin. Destino incerto e oscuro spetta al momento anche all'altro e più celebre spazio informativo di Leroy, lo storico Calyx, temporaneamente inaccessibile sul web: "The website has been down as a result of my Internet provider of 18 years (SFR, formerly Club-Internet) deciding to unilaterally suspend all users’ personal pages with no explanation, excuse or compensation. An announcement to this effect was made some months ago, to widespread disbelief, and I assumed this was a blunder or joke on their part. Unfortunately, this decision is now in effect, and Calyx has been taken down. Needless to say, I will cancel my subscription and change providers as soon as possible, and the website will be back online. Sorry for the inconvience." 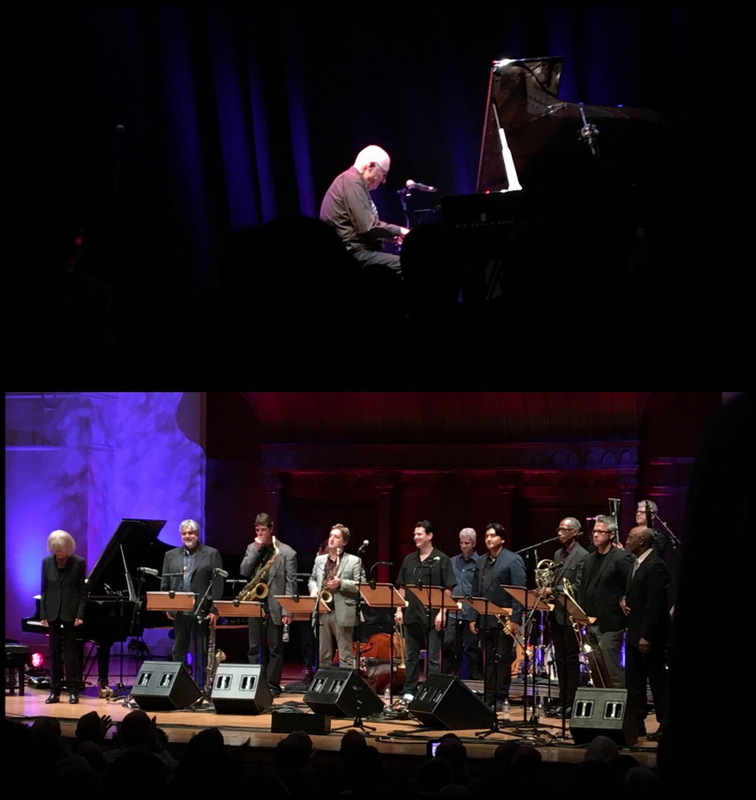 E' per questo pomeriggio al Kings Place a Londra l'appuntamento del pubblico del London Jazz Festival con Mike Westbrook per la presentazione del suo album per solo piano Paris. Accompagnerà il concerto una conversazione guidata da Philip Clark. Composer Mike Westbrook, ‘Britain’s most innovative Big Band leader’ (The Wire) is 80 this year and he celebrated this milestone by releasing the album A Bigger Show with his 22-piece Uncommon Orchestra. The Orchestra made its London debut before a capacity crowd at Kings Place in May, a concert described in Jazzwise as ‘ambitious, unapologetic and uncategorisable’. 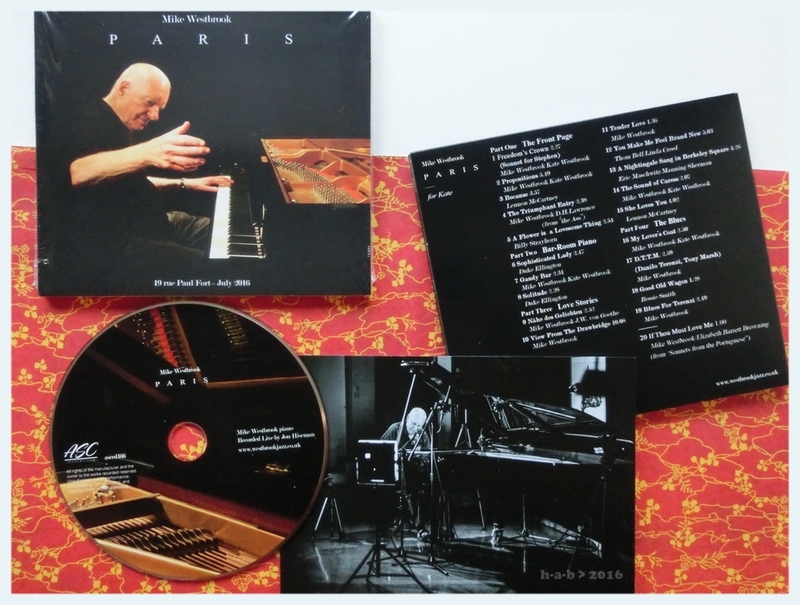 This time, in complete contrast, as part of the London Jazz Festival, Mike returns to Kings Place to give a solo performance and to launch his latest album Paris which was recorded in Paris in July. 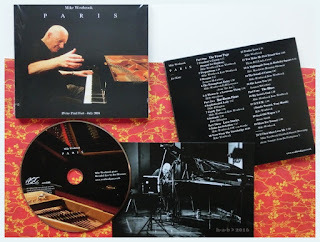 In a 75-minute set Mike improvises on themes from his own musical history and on songs written in collaboration with his wife, artist, vocalist and librettist Kate Westbrook, and with references across the spectrum of genres: Jazz classics, Pop music and the Blues. The performance will be followed by a conversation between Mike Westbrook and the musician and music journalist Philip Clark. 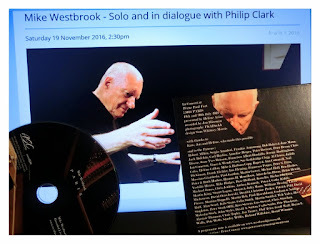 ‘Mike Westbrook has produced music that is by turns exciting, thoughtful and thought-provoking’ (London Jazz). Son tornate in pista più vispe che mai Irène Schweizer, Maggie Nicols e Joëlle Léandre, con concerti in questi giorni a Brighton, Derby, domani a Londra e poi Bristol: Les Diaboliques! Blurring the lines between free improv and cabaret, with a wickedly satirical edge, three fiercely independent spirits draw on some five decades of creative energy at the heart of European free improvisation with a collective history that stretches back to the Spontaneous Music Ensemble of the 1960s, and an extraordinary catalogue of collaborations, from Derek Bailey to Han Bennink to Louis Moholo-Moholo to much, much more. British vocalist Maggie Nicols, French bassist Joëlle Léandre and Swiss pianist Irène Schweizer formed Les Diaboliques in the early 90s – this is a rare opportunity to experience the artistry and intuitive chemistry of a seminal European ensemble. Un affascinante ritratto di Annette Peacock realizzato da Barry Hecker all'epoca di An Acrobat's Heart (Ecm, 2000), con una rara intervista tra registrazioni in studio, conversazioni, ricordi, spiritosaggini e lezioni su come si attraversa la strada sulle strisce. E' da qualche giorno su YT: Unsung Heroine. Spiega Newhouse: "When Luciano asked me if I'd like to add some tracks to an improvisation of his, I naturally said yes (I'm always open to making music with my overseas friends). 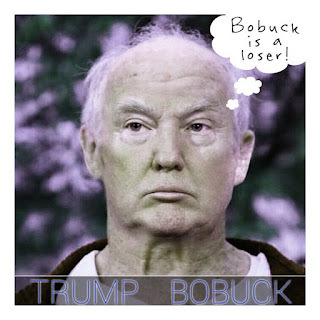 I was shocked, however, when he sent the reference track for me to load onto my studio software; it was over 40 minutes long! And it was one complete entity! Listening back to it, I realized that he and Federico had recorded this monster live, together, in one sitting. It was clear that the two of them already shared a very strong musical bond. But what really grabbed my attention was how structured it seemed to be; it had many varied musical elements, moments, and stages already enmeshed in it - powerful jazz rock sections, quiet modern classical bits, straight up jazz improvisation, moments of RIO, etc. And the pacing of it came off as very natural. It seemed to breathe as it moved along. I decided early on that I wanted my tracks to sound like I was also right in the room with them as they played, to try to come off as natural as Luciano and Federico already sounded together. I hope I succeeded in that." Sergio Nachira ha colto qualche attimo del concerto di Hobo - Eloisa Manera con Massimo Giuntoli - nella serata per Robert Wyatt allestita con Alessandro Achilli e organizzata da Musiche Nuove A Piacenza lo scorso 4 novembre: lo condivide alla sua pagina FB. 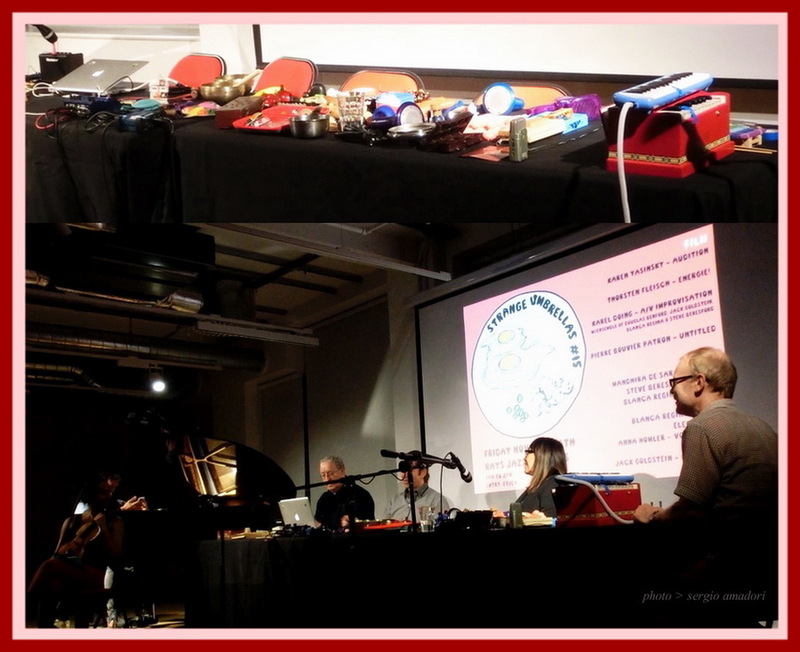 Sempre molto presente agli appuntamenti londinesi che danno spazio alla musica improvvisata, Steve Beresford è stato visto di recente alla festa d'anniversario di Mark Wastell per la sua Confront Recordings al Cafe Oto - dove rimpiazzava Keith Tippett, assente per motivi di salute - e giocoso protagonista poche sere dopo di una delle imprevedibili iniziative di Strange Umbrellas da Foyles, in questo caso in compagnia di Mandhira de Saram, Jack Goldstein, Anna Homler e dell'immancabile Blanca Regina. 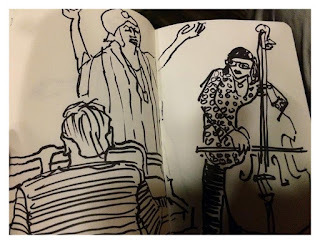 Geoff Winston scrive in LondonJazz del suo sublime intervento al Cafe Oto: "Beresford shares with Tippett a supremely inquisitive route to the potential of the instrument. 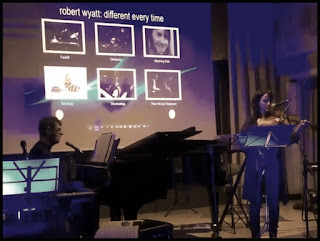 The area above and within the piano wires became the playground for a train of part-predictable events which he set in motion with a variety of interventions and implements - some tiny and battery-operated with their own lives - in tandem with direct, virtuosic keyboard technique. This two-pronged attack enshrined the aims of engaging and surprising the audience but also set in train an overlapping sequence of events which would surprise and occasionally ambush him, too. As with Tippett, jazz in all its flavours is a fundamental reference for Beresford and at the keyboard suggestions of lyrical Ellington rubbed shoulders with the attack of Cecil Taylor." 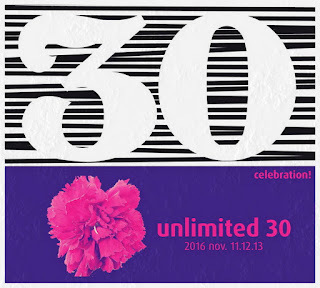 Sono insieme felici e dispiaciuti nell'annunciarlo, gli organizzatori, ma sappiano tutti - e in particolare i ritardatari nelle prenotazioni - che l'edizione del trentennale del Music Unlimited a Wels (Austria) è da tutto esaurito. E i festeggiamenti saranno non-stop, a partire da questo pomeriggio fino a domenica notte. “The Unlimited Festival in Wels, Austria, is one of the best places to explore free and creative, genre-bending music.” Wheee! Il catalogo dell'opera grafica di Peter Brötzmann, oggetto di una bella mostra inaugurata ad Amsterdam al Bimhuis lo scorso settembre, è disponibile in un corposo volume di quasi 400 pagine presso l'editrice tedesca Wolke Verlag. 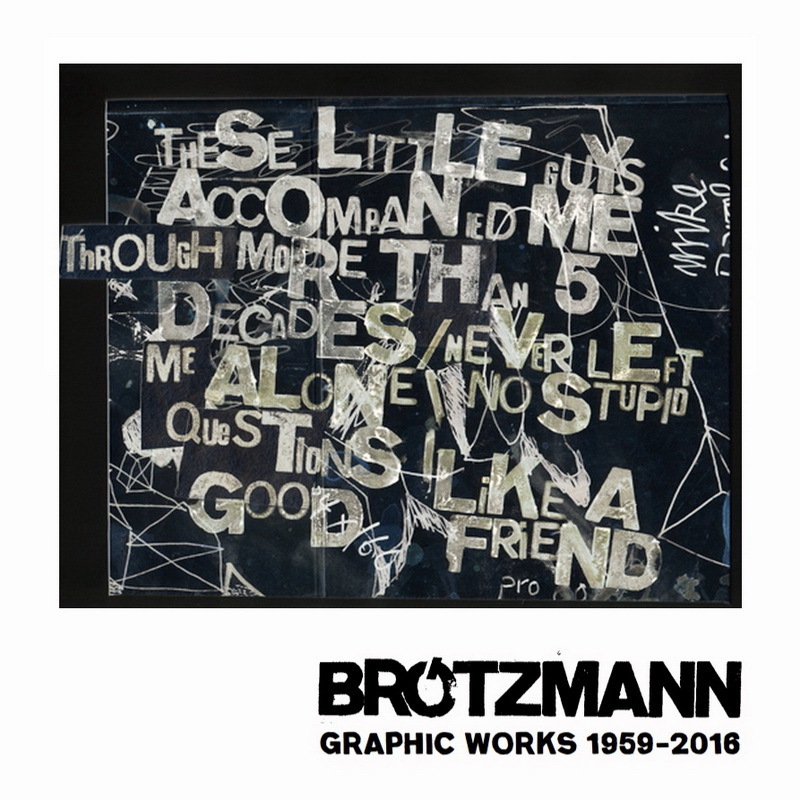 Scrive John Corbett: "In his graphic endeavors, Brötzmann has in fact made a body of work consistent with his music and his art, an oeuvre that undermines the presumption that design is inherently rigid. More than just the decoration of information, Brötzmann"s five decades of design bear witness to a sophisticated, delicate, and earthy sensibility, along with a dogged sense of internal logic. 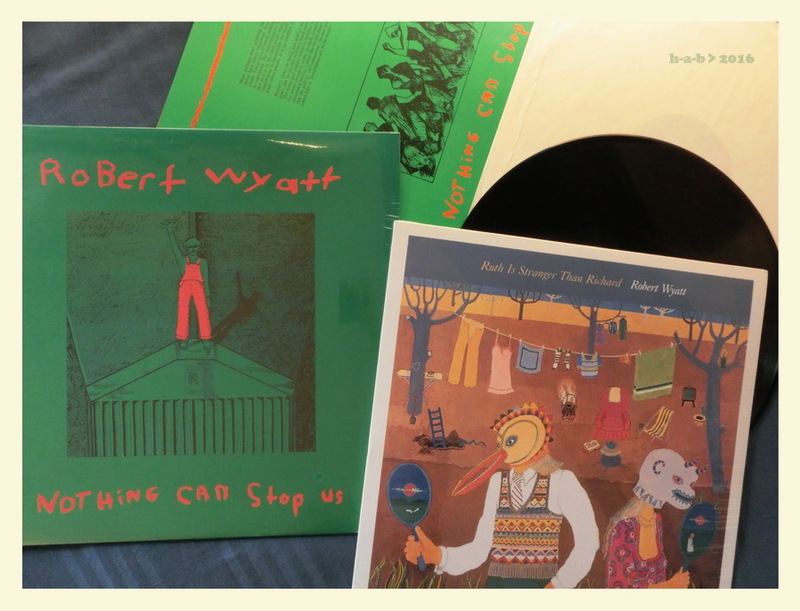 His record covers and posters are passionate and thoughtful, playful and brutal, basic and human." 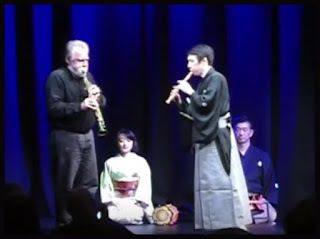 Lo straordinario incontro tra Evan Parker e Yukihiro Isso durante il festival Noh Reimagined promosso al Kings Place londinese lo scorso maggio è in un filmato disponibile da qualche giorno su YT. 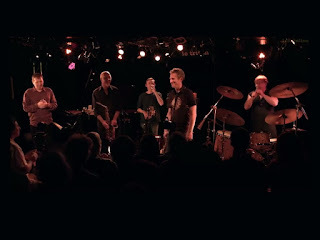 Kevin Le Gendre ne descrive un momento per Jazzwise: "Parker and Isso are at opposite sides of the stage and between them a half circle of three drummer-vocalists sit upright with unflinching poise. From the moment the players assemble under the lights the defining visual image is one of statuesque rigidity. Backs straight, heads high and faces inscrutable with concentration they are akin to taut strings on an invisible bow that vibrates potently as Isso and Parker unfurl a wide variety of phrasing that moves from onrushing streams to more tangential trails concluded with a playful suspense. As flinty and piercing as ever, Parker’s soprano assumes the role of a kind of ghost bass next to the whirring, fluttering crescendos of Isso’s flutes, of which there are eight, one looking very much like a buffalo horn with holes drilled into its middle. Pulling each instrument from his waistband as a warrior would a sword, Isso moves with dazzling stealth from one key signature to another, the highpoint of his ingenuity being the moment he deploys three flutes in a hail of Rahsaan Roland Kirk multi-phonics that frame a charming nursery rhyme-like melody. Parker’s ‘undergrowth rustle’ vocabulary makes a suitably primal backdrop, as his explorations of timbre are as shadowy as they are luminous." Un concerto solitario di Keith Tippett ripreso negli studi londinesi Gateway all'epoca delle registrazioni per Linuckea, trasmesso l'8 aprile 2000 dal programma della BBC Jazz on 3: lo si riascolta grazie a Inconstant Sol. 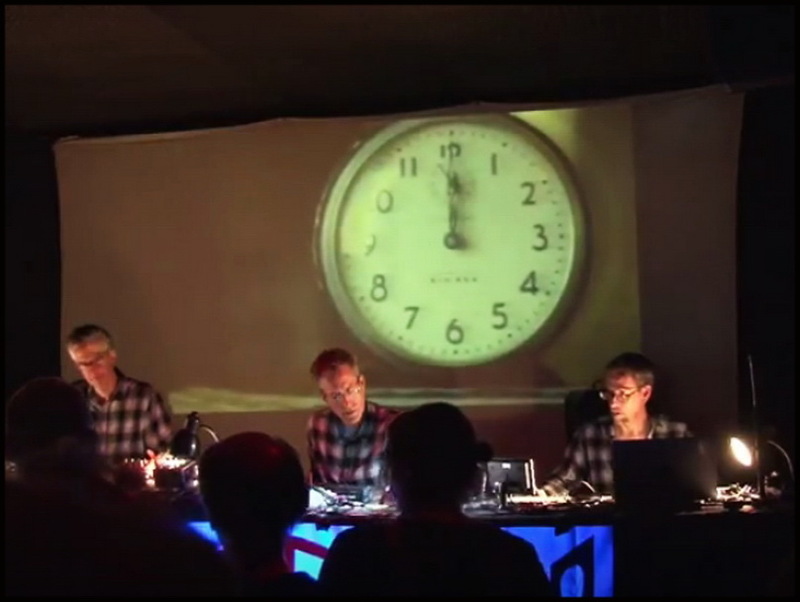 Uno dei recenti concerti in Italia dei Negativland è stato ripreso ed è ora disponibile integralmente su YT: è la data del 21 settembre, presso il Centro di aggregazione giovanile Tetris a Trieste. Nel frattempo è giunto alle stampe uno degli ultimi capitoli discografici del gruppo, il nono, tratto dall'incredibile serie radiofonica Over The Edge: si intitola The Chopping Channel, e tra mille cose contiene anche le ultime tracce - reali e virtuali - di uno dei membri del gruppo scomparsi negli ultimi tempi, Don Joyce. Negativland’s newest album is the summation of years of on-air research and development of the Chopping Channel: A place on the dial where music - and lots more! - was swallowed, digested, exhumed, consumed, and presented for sale at prices that didn’t last long. Broadcasting live from Negativland’s legendary Over The Edge radio program, this album brings you cultural appropriation at its most typical, with jokes that aren’t that funny because they aren’t really jokes. Atop a relentlessly atomized mix of thousands of fragmentary samples of indeterminate origin, re-mulched into one continuous and time-saving stream of music, the salesmen (and woman!) of the Chopping Channel dare to sell you the music you’re already listening to, as well as the culture you’ll need to survive in the years to come. 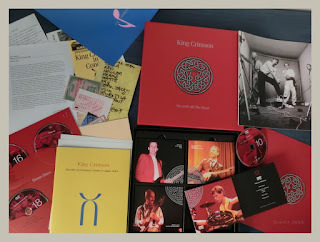 Occasione più ultima che rara - e che nemmeno era nelle premesse - per il pubblico italiano di andare a vedere e sentire dal vivo i King Crimson nei concerti in programma a partire da oggi a Milano, Firenze, Roma e Torino, presenti nella nuova formazione a sette che contempla Jeremy Stacey al posto di Bill Rieflin. In questi stessi giorni peraltro si fa sentire forte e chiara anche la formazione a quattro degli anni Ottanta - Fripp, Belew, Levin e Bruford - grazie alla pubblicazione del nuovo mega-box retrospettivo On (and off) The Road. "In postwar America, one generation of composers transformed music in the here and now – and opened a path to its future. 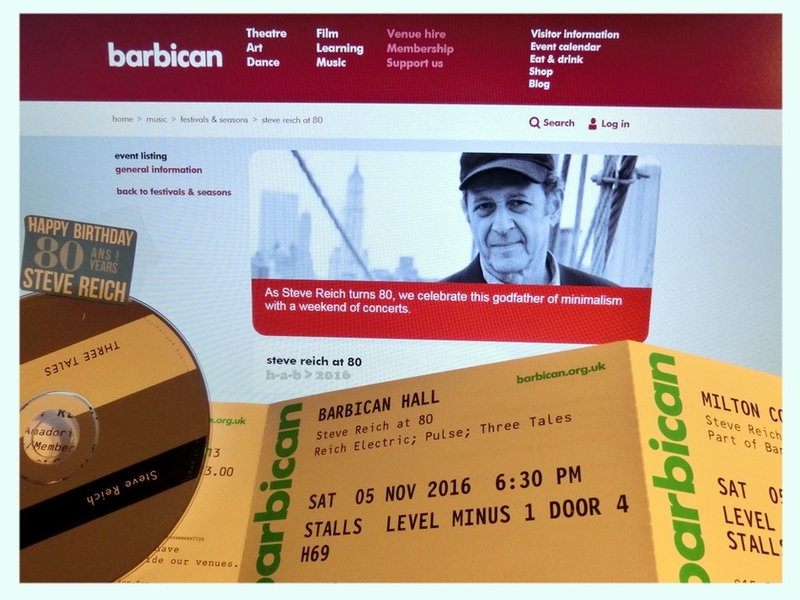 As Steve Reich turns 80, we celebrate this godfather of minimalism with a weekend of concerts." A Londra si festeggiano gli ottant'anni di Steve Reich con un caleidoscopico programma di conferenze, incontri con i protagonisti, mostre, prove aperte e concerti allestito al Barbican a partire da domani: una rilettura elettronica di Tehillim, Drumming, Reich Electric, la prima europea di Pulse, Different Trains, Three Tales in versione multimediale, Electric Counterpoint adattata per tredici chitarristi, e in finale l'intera London Symphony Orchestra impegnata in una selezione a sorpresa - dove spicca la monumentale The Desert Music - curata da Kristjan Järvi. 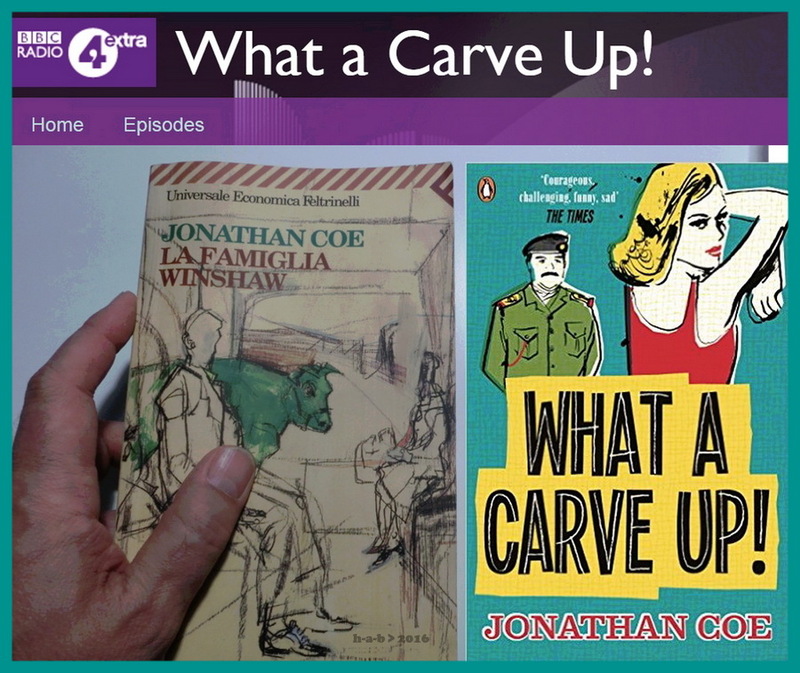 Si conclude domani per BBC Radio 4 la serie di repliche del felice adattamento radiofonico di uno dei capolavori di Jonathan Coe, What A Carve Up! (in Italia, La famiglia Winshaw), curato dal compianto David Nobbs e trasmesso finora una sola volta, nel 2005. Sempre tra le repliche, BBC Radio 6 Music ripropone un'oretta di musiche preferite dal Nostro: all'epoca la scelta cadde tra gli altri su Louise Le May, Stackridge, Pernice Brothers, Orwells, Sufjan Stevens e Sean O'Hagan. Nel corso di una sua visita alle isole Ebridi Esterne Ken Hyder indaga le tradizioni locali religiose e sociali ormai quasi perdute dell'antico canto gaelico dei salmi e ne fa rapporto alla BBC: The Song House. 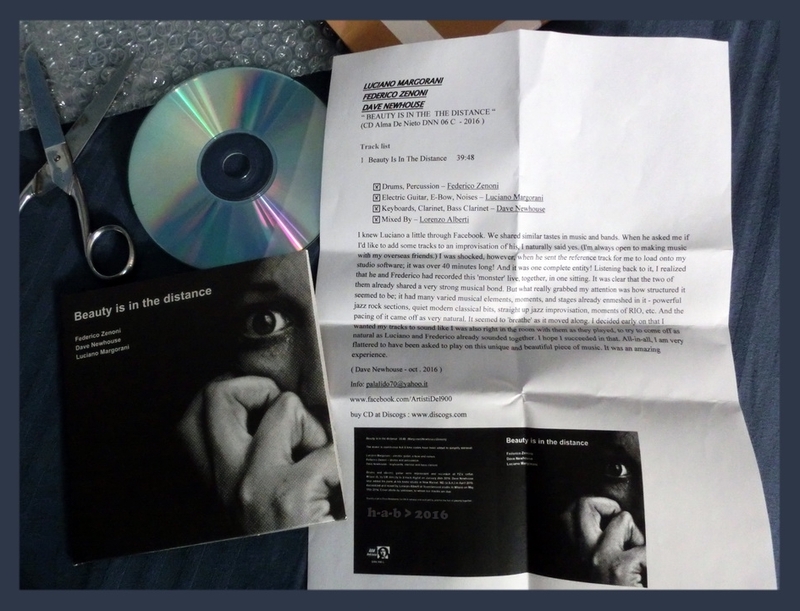 "This is amazing stuff that can sound like a choral version of Coltrane's Ascension... (Tim Hodgkinson). It is hard to believe that the strange, exuberant sound of Gaelic psalm-singing is a European, let alone British form of worship. It has been likened by some to Ethiopian Orthodox chant and cited by others as the root of gospel music. Yet beyond the handful of congregations that keep this centuries-old tradition alive, Gaelic psalm-singing is little known. 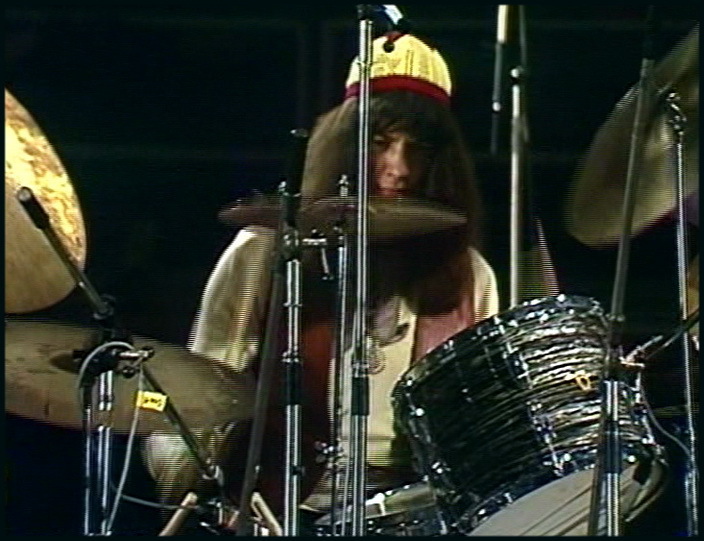 Even drummer Ken Hyder, musically curious and growing up in Scotland, only discovered it years later while in London. The sound of a hundred-strong congregation, each individual ornamenting the psalm tune in their own way, in their own time, blew him away. Hyder visits the Isle of Lewis in the Outer Hebrides. The tradition is strongest here - but even so, congregations for Gaelic worship often struggle to reach double figures. Travelling between kirk, croft and seashore, he hears the stories of the few remaining parishioners that remember a time when Gaelic psalm-singing was a fundamental part of daily life – families worshipping at home every morning and evening, and the fishermen out at sea, singing psalms in the twilight. 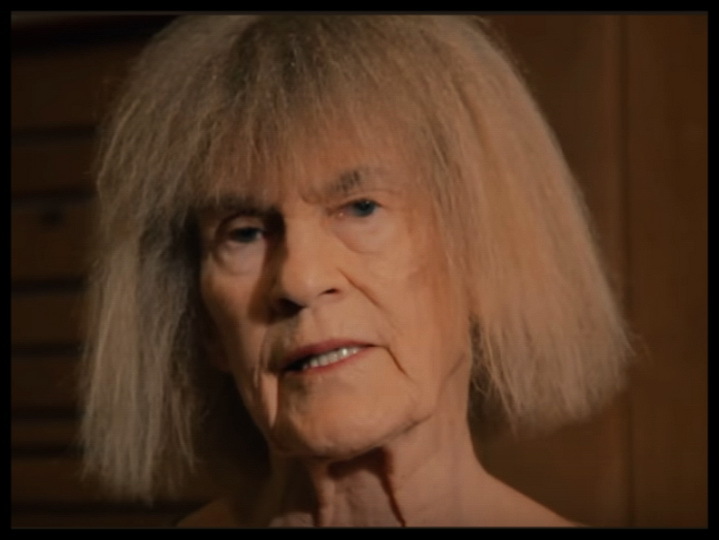 Ken meets those fighting the tide of Anglicisation in an attempt to preserve a form of worship that he has always believed is one of the seven musical wonders of the world. E' pronto l'album di Mike Westbrook registrato dal vivo da Jon Hiseman lo scorso luglio presso lo spazio artistico parigino di Heléne Aziza, 19 rue Paul Fort. Si intitola Paris ed esce in questi giorni per Asc Records. Quarant'anni di emozioni e ispirazioni condensati in un recital solitario che è soprattutto un atto d'amore: per Kate, per gli amici, per il pubblico. E per la Musica.